In a pickle about what new sport to pick up? Pickleball could be the answer! I first became aware of pickleball this past summer when playing it for fun with a few friends at an outdoor court in Edmonton. We played at a public, fenced-off area full of pickleball courts. Although we were just goofing around, I was having a blast. It is such a fun sport! I wondered if we had any pickleball venues in Calgary and decided to investigate. When I saw that pickleball was being offered as a sport discovery session during All Sport One City (ASOC), I signed up immediately. I was eager to get to know the sport better. Pickleball Club – Bill and Bill (I am not making this up) – greeted me and my fellow ASOC registrants upon our arrival. I asked Bill #1 if pickleball was becoming more popular. He responded by saying that the sport is the “FASTEST-GROWING SPORT IN NORTH AMERICA!” I can see why. I am going to try my best to convince you to try it out, too. Pickleball has a reputation of being a sport for seniors and that it is an easy sport because it is intended to be played by older people. I can assure you, however, from the perspective of this former university athlete, it is not easy or boring by any means! Bill #1 agreed with me in saying that pickleball is for everyone. He proceeded to inform me that the youngest player in the club is 13, and the oldest 84. It is rare to find a sport that can be played by such a wide range of ages, and competitively at that. If I start now, I should have a good 60 years to master the sport. Challenge accepted! Pickleball is played primarily as a doubles sport (2 vs. 2) but can be played in singles. The objective of the game is to use your paddle to hit the game ball onto the opposing team’s court, within the designated boundaries (lines) without them being able to return it, thereby scoring a point. It has similarities to other racquet sports such as badminton and tennis. Games are usually played to 11 points, but you must win by at least 2 points. The playing area is similar to that of a badminton court. Pickleball involves strategy, physical exertion and teamwork. I was running around the court chasing the ball down the entire session, while my partner, Bill #1, seemed to be in the right position every time and always knew where to place the ball on the other side. The Bills were very encouraging and proceeded to tell me it will take some time to get the hang of the game. Bill #2 filled me in on the culture of the sport. He told me that although pickleball can get very competitive at some levels, it is very much a social sport and incredibly inclusive. Players can come to the courts on their own and be invited to play in a game with no questions asked. 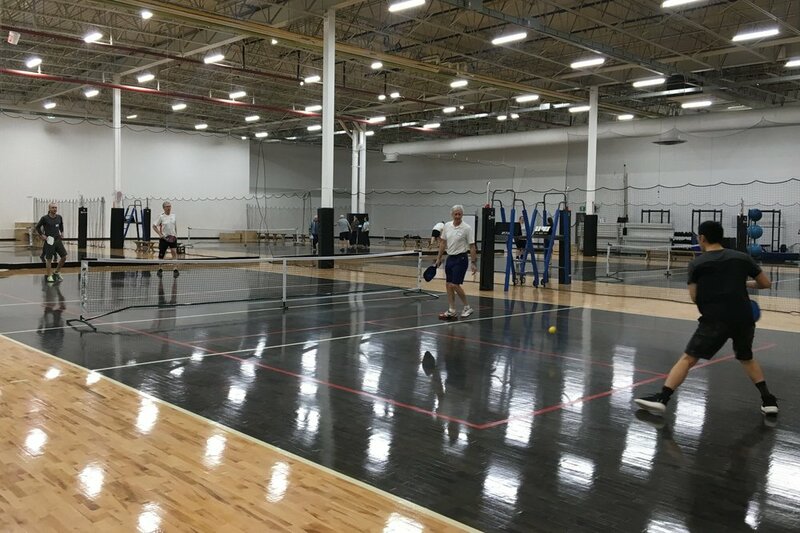 Individuals within the pickleball community are very friendly and welcoming and share similar value in wanting other people to give it a try and join in. Below are the five core values of the Calgary Pickleball Club. Fair play, inclusivity, exercise and health, safety, and fun. These values rang true within the people I met during my session, in the sport itself, and the overall environment over the thoroughly enjoyable 1.5-hour session. I could have stayed and played all day had I not needed to leave to attend class. Pickleball can be competitive or relaxed/recreational; whatever suits you. There are drop-in classes available at various community centres around the city. It can be played with a group of friends on a sunny Saturday during the summer, and if you are serious about it, there are opportunities to compete in leagues and tournaments. There are many opportunities to get involved with pickleball in Calgary. Try it out! For more information on rules, events, and how to get involved visit CALGARY PICKLEBALL CLUB!